PRESTAR PLASTIC TROLLEY 710X455MM 150KG PBS101 W/BRAKE is rated 5.0 out of 5 by 3. Rated 5 out of 5 by taydanny from Good quality and speedy delivery! Trolley received in good condition, prompt and pleasant transaction! Rated 5 out of 5 by Peko from Great Service & Good Brand Reliable seller and delivery was prompt. Prestar is a durable brand! Rated 5 out of 5 by ValJK from Product is very sturdy despite the type of terrian In comparison, this product is very sturdy and quite reliable, no matter the type of load(within specs). 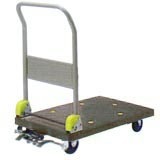 It moves smoothly with no lag despite an uneven ground, and extremely heavy load.